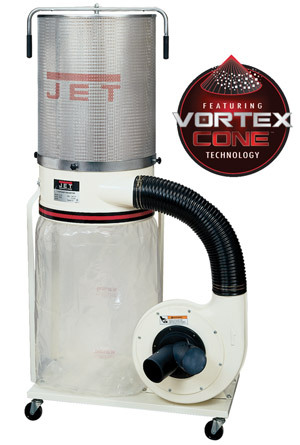 The JET DC-1100VX-CK features the exclusive Vortex Cone™ which improves chip separation to prevent clogging of the filter, and increases packing efficiency of the 5.3 cubic foot collector bag. The canister filter offers 6 times more area than over standard bag filters, and captures 98% of 2-micron particles. Includes four castors for mobility.